The biggest fight of 2015 is right around the corner, yet while Jose Aldo and Conor McGregor finally settle their business in the main event of UFC 194 on December 12, the rest of their featherweight division is also likely to get a shakeup over the course of nine days this month. From December 10 through December 19, the four UFC events slated for that spell will feature seven 145-pound matchups that will showcase the wares of the champion, the interim champion, and six members of the division’s top 15. In essence, the 2016 landscape will start to take shape in a big way, and here’s a look at what we will see. Brooklyn’s Nover never lived up to the “next Anderson Silva” tag pinned on him during season eight of The Ultimate Fighter, but after a rough first go in the Octagon, he has won four in a row and could make some noise in 2016 should he defeat Grozny’s Tukhugov. That will be a tough task though, as Tukhugov looks to be the real deal at 145 pounds. Owner of two UFC wins over Douglas Silva and Ernest Chavez, Tukhugov’s main issue may be a 14-month layoff, giving Nover, who has fought twice in 2015 already, a sharper edge heading into this pivotal bout. Fight fans were salivating for a matchup between Japanese veteran Kawajiri and rising star Mirsad Bektic, but an injury forced Bektic from the bout and brought in Mississippi’s Knight, a protégé of recently retired Alan Belcher. “The Kid” has won seven straight, and nine of his victories have come by submission, but fighting Kawajiri in any instance means a rough night; on short notice, even more so. But give Knight credit for stepping up and hoping to catch lightning in a bottle against a fighter who, at 37, still has some gas in the tank, as evidenced by his June win over Dennis Siver. A true fight fan’s matchup, the December 11 main event between Chad Mendes and Frankie Edgar just has to be good. Can we have 10 rounds please? This is a fun fight strictly from a stylistic standpoint, as you’ve got two hard-nosed wrestlers with championship level experience, Mendes with one punch stopping power and Edgar with a tenacious stick and move striking attack. But when you add in the high stakes involved, with Edgar likely next in line for a title shot with a win and Mendes making a case for his own crack at the belt if he emerges victorious, this is one you watch with your undivided attention – no Twitter, no Instagram, no talking to anyone around you. Just watch the fight. The storyline heading into this one is that Holloway and Stephens are friendly with each other having spent time in training camp together. That’s a good one. But the storyline I like better is that Holloway, who has been on a tear, winning seven in a row, could have waited to see how everything around him went before deciding to make his move toward a title shot in 2016. Instead, the pride of Waianae takes on one of the most dangerous fighters in the division in Stephens, who has a nice story around him as well. Iowa’s “Lil’ Heathen” has quietly won four of six at 145 pounds, and with his one-punch stopping power, a win on December 12 could have him in the title picture as the New Year dawns. If you need to know why this fight is must see TV, then you’ve probably come to the wrong website. Built up for months, postponed after an Aldo injury in the summer, but finally back on, this fight is one of those ones that will have even the most jaded fight fan feeling the butterflies in his or her stomach just before the two are waved into battle. 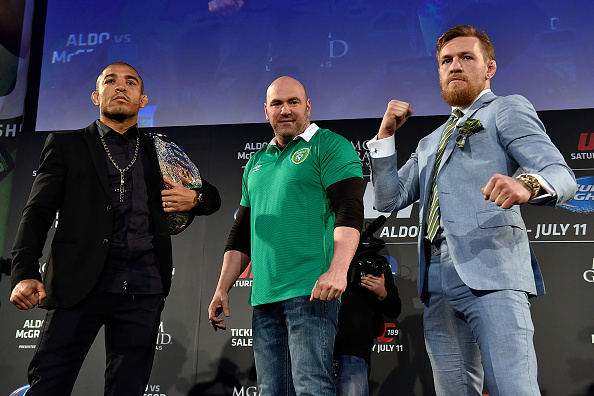 Aldo is the greatest featherweight of all-time and the pound-for-pound king, two titles “The Notorious” Mr. McGregor will be trying to make a run at sooner rather than later. And if he defeats Aldo, it may be a lot sooner. Expect the roof to come off the MGM Grand Garden Arena when this one is over. Flying under the radar thanks to the ton of high-profile featherweight matchups taking place around it, the crossroads battle between veteran Cole Miller and up and comer Jim Alers could steal the show when the UFC heads back to Orlando a week after UFC 194. Alers has shown flashes of brilliance but needs to be firing on all cylinders to beat Miller, who could very well be 5-0 or 4-1 and not 3-2 in his last five if not for some questionable judging and injury issues. Still ranked ninth in the world in the lightweight division, Myles Jury left 155 pounds behind to make a run in the 145-pound weight class, and he’s a welcome addition to a crowded talent pool. But he got no gimme in his featherweight debut against Charles Oliveira, a dynamic finisher who will be pushing the pace hard and looking to submit or knock Jury out from start to finish. If Jury is the real deal in his new division, we’ll know on December 19 for sure.